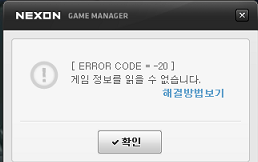 Currently my friend is having issues with installing Closers online, he has download closers from this forum and even i tried to help him out and give him my setup but everytime he tries to open the setup it says "Error Code -20" which means that the files are corrupted. He is using Windows 8. I apologize if this was the wrong section to post this and i can ask him to post a picture of the error if it is needed. Need screenshots,is the error from the game,patcher, or website NGM? also need text to translate,can't really help with numbers only you know.